What Is Hoisin Sauce and How Is It Used? Hoisin sauce is a fragrant, pungent sauce used frequently in Asian vegetable stir-fries, marinades, and grilled dishes. 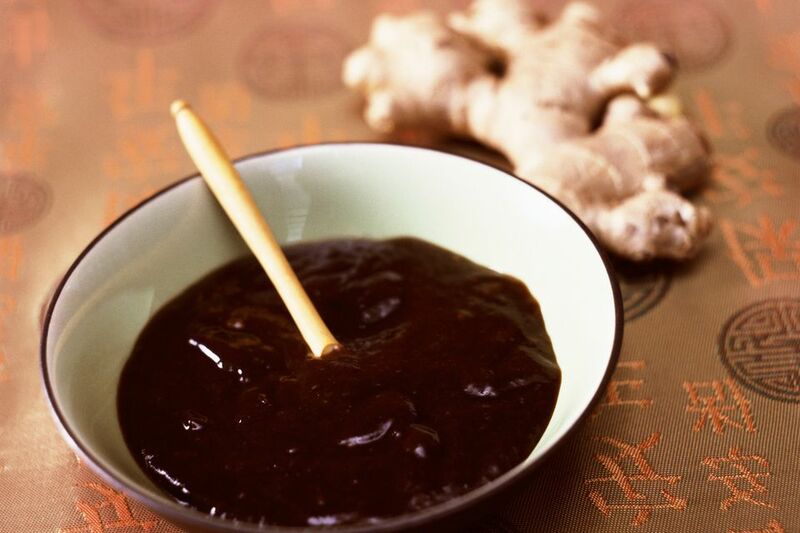 Hoisin sauce is a key ingredient in many Chinese dishes and some Vietnamese food recipes. It is sometimes called Chinese barbecue sauce. Hoisin sauce is condiment based on fermented soybean paste with other flavors and spices. It adds an Asian flavor to dishes, combining umami with sweet, tangy, and spicy elements. It is not made with any animal products and is therefore suitable for vegans and vegetarians, although it is traditionally served with Peking duck, a Cantonese dish. If you are eliminating gluten from your diet, be sure to check the ingredient label for any hidden gluten. Since it is typically made with soybeans, you would have to look for a soy-free version made with a different bean if you are eliminating soy from your diet. Little is known about the origins of hoisin sauce other than that it is Cantonese. The name hoisin comes from the Chinese word for seafood, and earlier formulations might have had a seafood ingredient to provide the umami flavor. Today, it doesn't contain any seafood. Not only that, it usually isn't used with seafood, so the origin of the name is a mystery. Hoisin is dark in color and thick in consistency. It has a very strong salty and slightly sweet flavor. Hoisin sauce does taste a bit like an American-style barbecue sauce, but much saltier, richer, less sweet, and has a flavor all of its own. The fermented soybeans add the savory umami element that some other sauces use fish or meat to achieve. Because the unique taste can be overpowering, particularly if you’re new to Asian cuisine, it’s recommended that you use only a bit at a time to experiment with the flavor. Or, dilute the flavor by adding water or oil to the hoisin sauce before using in a recipe. Hoisin sauce is a great way to add an authentic Asian flavor, thickening, and color to a stir-fry or noodle dish. It can also be used as a dipping sauce for egg rolls, spring rolls, or other appetizers. You will find hoisin sauce in a variety of recipes from main dishes to stir-fries to vegetable side dishes. Many Asian vegan and vegetarian recipes call for hoisin sauce, including grilled tofu, vegan Chinese stir-fry, and Thai stir-fry. If you can't find hoisin sauce at the store, your best bet is to use a recipe to make a substitute with peanut butter, miso, or black bean paste; you can also make a raw vegan version. You might substitute Chinese brown bean sauce or chee hou sauce if you have those on hand; both of these are made from soybeans but may be spicier than hoisin sauce. Another quick substitute is to take typical American sweet barbecue sauce and add Sriracha and Chinese five spice powder. Be sure to check any substitutes to see if they include things you are eliminating from your diets such as animal products or gluten. Many grocery stores stock hoisin sauce in the Asian food aisle; look for brands such as Lee Kum Kee. You may want to seek out more authentic producers from Asia by shopping at Chinese or Asian specialty grocers. You can also buy hoisin sauce online. An unopened bottle of hoisin sauce can be stored in a cool, dark place and will be shelf-stable for a couple of years. Check the bottle for its "best by" date that will indicate when it will begin to degrade. If you have had the sauce for a while, ensure it hasn't grown any mold or developed an off odor. Once you open a bottle, it should be refrigerated. But you don't have to use it quickly as it should last for up to a year in the refrigerator, thanks to the high salt content that keeps bacteria and mold at bay. Signs that it's time to toss it include mold, odor, or discoloration. Hoisin sauce is a convenient way to add a Cantonese flavor profile to a dish. Hoisin sauce will be very salty no matter which kind you buy, so it's not suitable for those on a sodium-restricted diet. A typical hoisin sauce has 258 milligrams of sodium per tablespoon, as well as 35 calories, 0.5 grams fat, 0.5 grams protein, and 7 grams carbohydrates.